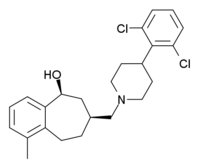 SB-612,111 is an opioid receptor ligand which is a potent and selective antagonist for the nociceptin receptor (ORL-1), several times more potent than the older drug J-113,397. It does not have analgesic effects in its own right, but prevents the development of hyperalgesia, and also shows antidepressant effects in animal studies. ↑ Spagnolo, B; Carrà, G; Fantin, M; Fischetti, C; Hebbes, C; McDonald, J; Barnes, TA; Rizzi, A; et al. (2007). "Pharmacological characterization of the nociceptin/orphanin FQ receptor antagonist SB-612111 (−)-cis-1-methyl-7-4-(2,6-dichlorophenyl)piperidin-1-ylmethyl-6,7,8,9-tetrahydro-5H-benzocyclohepten-5-ol: in vitro studies". The Journal of Pharmacology and Experimental Therapeutics. 321 (3): 961–7. doi:10.1124/jpet.106.116764. PMID 17329552. ↑ Zaratin, PF; Petrone, G; Sbacchi, M; Garnier, M; Fossati, C; Petrillo, P; Ronzoni, S; Giardina, GA; Scheideler, MA (2004). "Modification of nociception and morphine tolerance by the selective opiate receptor-like orphan receptor antagonist (−)-cis-1-methyl-7-4-(2,6-dichlorophenyl)piperidin-1-ylmethyl-6,7,8,9-tetrahydro-5H-benzocyclohepten-5-ol (SB-612111)". The Journal of Pharmacology and Experimental Therapeutics. 308 (2): 454–61. doi:10.1124/jpet.103.055848. PMID 14593080. ↑ Rizzi, A; Gavioli, EC; Marzola, G; Spagnolo, B; Zucchini, S; Ciccocioppo, R; Trapella, C; Regoli, D; Calò, G (2007). "Pharmacological characterization of the nociceptin/orphanin FQ receptor antagonist SB-612111 (−)-cis-1-methyl-7-4-(2,6-dichlorophenyl)piperidin-1-ylmethyl-6,7,8,9-tetrahydro-5H-benzocyclohepten-5-ol: in vivo studies". The Journal of Pharmacology and Experimental Therapeutics. 321 (3): 968–74. doi:10.1124/jpet.106.116780. PMID 17329551.